THE EVERGLADES, Florida (CNN) -- Joe Wasilewski drives along a narrow stretch of road through Florida's Everglades. The sun is setting, night is coming on quickly, and Wasilewski is on the prowl for snakes -- and one snake in particular. Reptile expert Joe Wasilewski holds a Burmese python he found in the Florida Everglades. "The next 10 miles seem to be the hot spot for Burmese pythons," he said. Wasilewski is a state-sanctioned snake-hunter who regularly scours this area for the reptiles. The Everglades, known as the River of Grass, has the perfect space and climate for pythons to hide and breed. And breed they do: The largest clutches found in the Everglades have contained 83 eggs. They are also speedy travelers, able to move across 1.6 miles of land every day, experts say. The travel lets people like Wasilewski hunt the snakes from the driver's seat of his truck. But it also means that the problems created in the local ecosystem by the non-venomous snakes are spreading. "It's a large predator, and they're eating basically everything in sight. That's the problem," Wasilewski said of the Burmese python. Volunteers like Wasilewski, happy to grasp the problem and the snakes with both hands, are not the only troops in Florida's war on the invading pythons. A "Python Patrol" was launched in the Florida Keys, south of the Everglades, by Alison Higgins of the Nature Conservancy. Her program uses utility workers, wildlife officials, park rangers and police to keep an eye out for snakes and trains them to capture any they find. "The Burmese pythons that are coming out of the Everglades are eating a lot of our endangered species and other creatures, and we want to make sure they don't breed here," said Higgins, the conservation manager for the Keys. It is believed that the problem originated when reptile-breeding facilities near the Everglades were destroyed during Hurricane Andrew. Compounding the problem is the release of these snakes by pet owners. "These pets were released by owners that do not understand the threat to the ecosystem," Everglades National Park spokeswoman Linda Friar said. She said the pets, which can grow to 200 pounds and live for 30 years, often get too big for owners to handle. The state has a pilot program with several volunteer snake hunters such as Wasilewski. 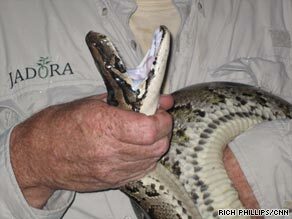 Twenty years ago, no Burmese pythons were found in the Everglades, park statistics say. Now, there could be 100,000 snakes in the River of Grass, but no one knows for sure. What Wasilewski, an expert on reptiles, is sure of is that night is the best time for his hunting, as that is when the snakes tend to be on the move. When he finds his prey, he puts the snake in a bag, deposits it in a crate and delivers it to biologists for the Everglades National Park, where the snake can be studied and/or destroyed. On one recent evening, the pickings were slim, and after two hours of driving back and forth along the two-lane Tamiami Trail, Wasilewski's crate was empty. He saw a python on the road, but it was dead, and the other small snakes and a baby alligator in the area did not interest him. Finally, Wasilewski, an environmental and wildlife consultant, spotted something. "Yeah, baby! Hee ha! Look at the size of this one," he exclaimed from the front seat of his truck. He got out and picked up the brownish-green snake, which immediately coiled around his arm. "This isn't a big one," he said, but as he got a closer look, he did not deny that it was a good one: "At least 12 [feet.]" Wasilewski has a soft spot for these species, and one of the reasons he volunteers for the snake hunt is to learn more about them. He says it is not the snakes' fault that they ended up in the Everglades, but he acknowledges the problems they are causing on the Florida ecosystem and the need to do something. "One down, 100,000 to go," he said.